Титулы: International Champion,Italian CH,Slovenia CLUB WINNER,Caucasian Winner, Mediteranian Winner, Champion of Croatia, Champion of Cypro,Champion of Russia,Champion of Slovenia, Champion of Macedonia, CH.of San Marino, Grand Champion of San Marino,Champion of Giorgia, Champion of Montenegro, Champion of Moldavia, Champion of Azerbaijan, Jr. 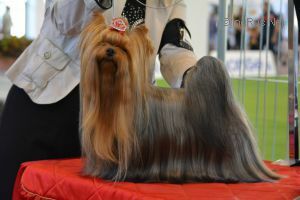 Winner Eurasia 2013, Jr.Ch of Russia, Jr.Ch of Slovenia, Jr.Ch of Cypro, Jr.Ch of Rep.San Marino, EUROPIAN DOG SHOW 2013- 2 place intermedia class, WORLD DOG SHOW 2013 - 3nd place in JUNIOR class. 12 x CACIB, 31 X CAC, 9 X BOB, BIG Winner.